Despite their classifications, there’s no doubt that two of the best teams in the state will be facing off when the Bishop Miege Stags take on the St. Thomas Aquinas Saints on Friday night. Dubbed the Holy War, the Eastern Kansas League game features two teams that are ranked first in their respective classes and are both 2-0 against Class 6A teams this season. The Stags, who have won the past three Class 4A Division I state championships, enter the game on a 14-game winning streak. This year, Bishop Miege has defeated 6A’s Blue Valley and Gardner-Edgerton by a combined score of 103-10. The Stags are led by senior quarterback Carter Putz, who has been the model for efficiency this season. He’s completed 32 of 38 passes for 453 yards and six touchdowns. He entered the season needing only seven passing touchdowns to surpass Silver Lake quarterback Shannon Kruger’s career record of 92. Putz’s top target is sophomore Daniel Jackson with 10 catches for 210 yards and two touchdowns. On the ground, Miege is led by senior Cameron Clark with 226 rushing yards and sophomore Brison Cobbins with 177. Defensively, Jalen Williams paces the team with 19 tackles, including three sacks. Aquinas opened the season with a 35-14 win over Gardner-Edgerton followed by a 28-14 win over Blue Valley North, which is ranked in Class 6A. 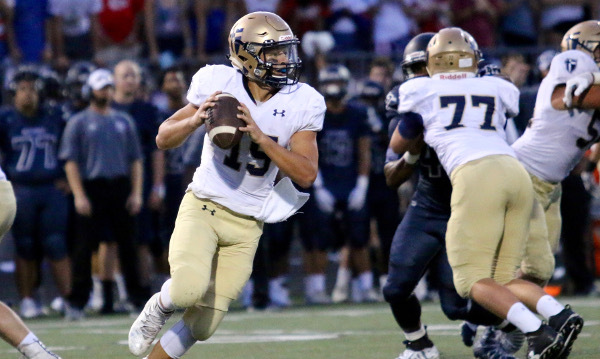 Saints quarterback Will Swanson and running back Cameron Jackson scored two touchdowns each in the win over Blue Valley North. The Saints returned 10 starters on offense and eight on defense from last year’s team that finished 8-4 and advanced to the Class 5A semifinals. Bishop Miege beat Aquinas 48-21 last year. The Stags are on a five-game winning streak in the series. The two Topeka schools will match up for a Centennial League battle. After falling 61-46 in the opening week to 6A’s Topeka High, Hayden bounced back with a 20-13 win over Emporia in Week 2. Matt Moore and Brandon VanBecelaere lead the Wildcats’ rushing attack with 150 yards each. Sampson Huston has completed 25 of 50 passes for 351 yards and five touchdowns. DeShawn Hanika leads the city in receiving with 13 catches for 200 yards and four touchdowns. As a team, Hayden has been extremely balanced on offense with 213.5 yards on the ground and 175.5 through the air. Class 5A’s Topeka Seaman is 2-0 after lopsided wins over Topeka West (52-0) and Highland Park (47-6). Most of the Vikings’ offensive success has been on the ground as they’re averaging 244 rushing yards and 84 passing. Dalton Temman and Kobe Jones lead the rushing attack with 118 and 109 yards, respectively. Jones has also completed 12 of 25 passes for 158 yards and three touchdowns. Last year, Seaman beat Hayden 14-0. Before that, the Wildcats had defeated the Vikings in the previous three meetings. Last year, Wichita Collegiate defeated Buhler, 45-21, for the Crusaders’ biggest loss in more than nine seasons. These two squads have rarely matched up, with just three meetings from ’04-16. Buhler won 28-21 in ’12 and 35-28 in ’13. Last fall, Buhler eventually rebounded and lost to Bishop Miege in the 4A-I state championship game. This year, Buhler opened second in 4A-I but lost to McPherson in the season opener, mainly because of the Bullpups’ big plays. McPherson had a key 50-yard pass, 94-yard pass and a 59-yard punt return. Collegiate, ranked No. 1 in 4A-II, started with a 42-0 win against Rose Hill and then pulled away from Hoisington late in a 35-20 victory. Collegiate lost to Hoisington last season. Last week’s win ended the Cardinals’ 27-game winning streak. The Spartans trailed 20-14 in the third quarter before scoring 21 unanswered points. Collegiate quarterback Cody McNerney had 156 passing and 163 rushing yards with four scores accounted for. Through two games this year, he has completed 21 of 41 passes for 409 yards with a 5/0 TD/INT ratio. He has rushed 23 times for 254 yards and four scores. Senior Mac Copeland, a University of Kansas commit, has paced the line, part of just four offensive and three defensive starters back. Buhler has traditionally had a smash-mouth running game and stout defenses, but has struggled some in pass defense in the last two years. In last year’s win versus Buhler, McNerney completed 27 of 41 passes for 316 yards with five scores against one interception. Additionally, Buhler permitted Circle to throw for 288 yards with a 3/1 TD/INT ratio in 2016 in a 65-40 Buhler win. In the season opener against McPherson last year, Buhler held the Bullpups to 2.1 yards a carry but permitted 142 in the air with a 2/0 TD/INT ratio. In the state title game, Buhler limited Miege to 3.6 yards per carry, but Stags quarterback Carter Putz threw for 357 yards with five scores against no interceptions. Buhler has plenty of elite talent, including senior running back Dalton Brown, who ran for more than 1,900 yards in 2016, and senior defensive ends Brendan Webb and Braden Rose. After the McPherson loss, Buhler defeated Andover Central, 37-7. Buhler had just 51 rushing yards versus McPherson. Collegiate’s run defense received a stiff test against Hoisington and did well. The Spartans should be able to complete several big passing plays and slow down Buhler’s run game enough for the victory. Last year, Pratt proved to be Kansas’ biggest surprise with a rise to the 4A-II state title. This year, Nickerson is considered one that could have a similar breakthrough. Coach Mike Vernon has led one of the state’s top turnarounds in the last several years. Nickerson won just one game in the two years prior to his arrival and has posted 4-6, 6-4 and 2-0 marks since. This year, Nickerson has opened with big wins against struggling teams with a 48-8 victory against Haven and 53-14 versus Lyons, both at home. Last year, the Panthers beat those two squads by a combined 96-16. Then, the Panthers lost to its Central Kansas League foe Pratt, 55-26, before marquee wins against Hesston (36-27) and Larned (36-14). Nickerson finished with an average score of 32-24 in 2016, while Pratt was at 39-17. Nickerson has plenty of experience in the backfield and a strong, returning offensive line. Senior fullback Peyton Kuhns rushed 19 times for 177 yards and six scores against Haven in a game called with 2:01 in the fourth quarter. Pratt had a wild season-opening win against Larned, 56-46, and then beat Haven, 49-8. The Greenbacks led Larned 42-39 at halftime. Pratt posted 57 rushes for 546 yards. Travis Theis rushed 34 times for 376 yards, including an 80-yard score on the game’s first play. Theis, who rushed for 1,975 yards and 24 scores last year, has already tallied 55 times for 560 yards and eight scores. Returning senior quarterback Landen Studer has 11 carries for 141 yards and two TDs and completed 4 of 4 passes for 112 yards with a 2/0 TD/INT ratio. Pratt has won 10 straight contests. The Greenbacks returned just one defensive starter from last fall. Pratt is 10-1 in this series dating back to ’04, including four straight victories. Last year, Nickerson’s 26 points were the highest for the Panthers in the 11 contests. Pratt rushed 52 times for 349 yards. Nickerson slowed Theis to 6.5 yards a carry, his ninth-highest total of the year. This could be the first of two meetings between the teams this year. Last season, Pratt announced itself as a contender when it defeated defending state titlist Holcomb in Week 8, 35-28, and ended the Longhorns’ 16-game winning streak. This year, Nickerson has elite offensive talent and can move the ball. Theis is one of the state’s top players and will put up numbers. A key statistic to watch is his yards per carry and whether Nickerson can hold him from big runs. The Panthers should have its highest offensive output against Pratt since ’04. Like Pratt last season, Nickerson can deliver a signature win Friday. A Central Kansas League matchup of two teams just outside the top-5 in Class 3A. Larned entered Week 7 last season with an 0-6 record. Since then, the Indians have been on a remarkable run. The Indians defeated Lyons, 49-0, and lost to Hoisington, 56-27, which was then No. 1 in Class 3A. Larned beat Ellsworth, 42-21, to clinch a playoff berth. The Indians earned their first playoff win since 1985 with a 35-30 road win versus Cimarron. Then, Larned played Phillipsburg (which had beaten the Indians, 50-0, earlier in the season) to a 14-7 loss that came down to late in the fourth quarter. This year, Larned lost to Pratt, 56-46, before a big, 28-14, win against Smoky Valley. In the Pratt loss, Anthony McConnell recorded 18 carries for 110 yards. Wes Davis had 10 carries for 92 yards. Carson Smith completed 11 of 17 passes for 220 yards, including four catches for 120 yards for DaMontay Phillips. Last week, Larned opened up with a 7-0 lead on a McConnell score. Smoky Valley had a 19-play drive but turned the ball over on downs inside the Indian 5-yard line. her McConnell touchdown, Smith connected with one of his wide receivers, Mason Perez, for a 21-6 lead just before halftime. McConnell eventually finished with three TDs. Smoky Valley eventually ran 32 more offensive plays than Larned. Hesston opened last year 1-3 with its only win against Larned. Then, the Swathers won nine straight before a Class 3A overtime state loss to Rossville. Coach Tyson Bauerle, formerly at Sterling, has led the Swathers to a 1-1 start. Hesston fell 28-24, to Garden Plain but then beat Halstead, 37-22. Junior running back Parker Roth, who rushed for 1,270 yards last fall, had 24 carries for 265 yards and two scores. He delivered 181 yards in the season opener. Senior Cameron Cox has taken over at quarterback. Cox rushed 19 times for 171 yards and two scores and threw for 105 yards in Week 2. Hesston’s defense permitted Halstead’s Dalton Kraus to complete 13 of 15 passes for 181 yards. The Dragons rushed 42 times for 203 yards. Against Garden Plain, Hesston permitted 48 carries for 318 yards and 103 yards in the passing game. Last year, Hesston beat Larned, 41-13, in the team’s only matchup in the last 12 years. Larned has quickly emerged as one of the stronger teams in 3A, while Hesston remains explosive. Both teams have plenty of standout talent at multiple positions, specifically with McConnell and Roth. Both teams have struggled with run defense. A key Larned difference has been an improved passing game with Smith. Expect another high scoring game – and Larned to continue its climb up 3A with a big home win. Holton will visit Class 3A’s second-ranked Nemaha Central Thunder in a rematch of one of the top games of the 2016 season. Nemaha Central senior quarterback Ryan Hasenkamp scored on a 1-yard run with less than a minute to go to pull the Thunder within 42-41 of Holton. Thunder coach Warren Seitz decided to go for the two-point conversion and the win considering his team had struggled to slow down the Hotlon ground game all night. Hasenkamp’s second effort got him barely across the line and propelled the Thunder to a 43-42 victory. Not only was it a heartbreaking last-second loss for the Wildcats, but it marked the program’s fourth consecutive loss – almost unheard of in the Brooks Barta era at Holton. Entering Friday’s game, Holton is again coming off a loss. The Wildcats were shutout by fellow Big 7 Conference member Sabetha, 21-0, last week. The Bluejays held Holton to only 137 yards of total offense. Despite last week’s setback, Holton showed the potential of another powerful running game in a 45-14 season-opening win over Atchison. The Wildcats rushed for 329 yards and six scores in the opener, led by Jayger Carson’s 131-yard effort. Senior Dylan Aeschliman chipped in three rushing touchdowns. Last season, Holton ground out nearly 550 rushing yards on the Thunder defense. The Wildcats had a 34-21 lead in the fourth quarter before Hasenkamp led the Thunder back with his ability to throw the ball (215 passing yards in the game). Mitchell Henry has stepped in for the departed Hasenkamp the performed well. Henry passed for 248 yards and three touchdowns in last week’s 55-14 win over Royal Valley. He can be equally explosive running the ball as evidenced by his 139 rush yards with three more scores in last week’s win. Through two games this season, Henry has thrown for more than 300 yards and five touchdowns while throwing only two incompletions. Luke Haverkamp has been the top receiving target this season with four touchdown grabs. The Thunder may need another balanced effort on Friday night.